LIGHTEN UP. AND GO HEAVY. Legendary composer John Williams has created the musical landscapes for E.T., the Extra-Terrestrial, Jurassic Park, Star Wars, and more. We open the Pops season with a celebration of John Williams’s Hollywood film scores. Hear vocal sensation Steve Lippia croon the classics by icons such as Nat King Cole, Tony Bennett, Sammy Davis, Jr., and Ol’ Blue Eyes himself, all backed by your favorite swingin’ band, the MSO. Bring the family to Milwaukee’s musical holiday tradition! Broadway soprano Rebecca Luker joins the MSO for Holiday Pops, a jubilee of carols, classics, and sing-alongs. This beloved event sells out every year! The MSO pays tribute to the Queen of Soul, Aretha Franklin, in a program including “Respect,” “Think,” “A Natural Woman,” and more. Dazzling vocalists Capathia Jenkins and Ryan Shaw lend their voices to this musical celebration. The Beatles come to life in Revolution, a vocal and symphonic tribute accompanied by a collection of photos, videos, and animations. 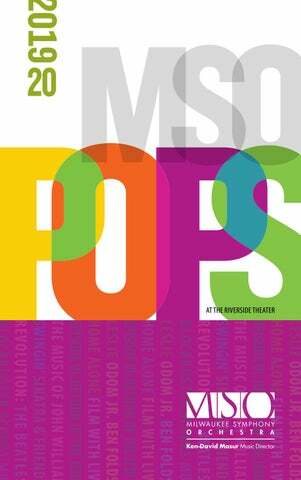 This musical and visual journey includes over 25 Beatles top hits, all performed live by the MSO. A great soundtrack can create drama, intrigue and romance. In this program we explore the world of blockbuster movie and TV scores, from Back to the Future to Downton Abbey to Game of Thrones and beyond. POPS SUBSCRIPTION by adding these spectacular performances to your season itinerary. Genre-bending singer-songwriter Ben Folds comes to Milwaukee to blend his chart-topping hits with the full power of the MSO. Listen for the best of Ben, including “Brick,” “You Don’t Know Me,” “Luckiest,” and a movement from his Billboard chart-topping piano concerto. A true holiday favorite, this beloved comedy classic features John Williams’s charming and delightful score, performed live by the MSO. Hilarious and heartwarming, Home Alone is holiday fun for the entire family! for PR IOR in the ITY seati ng Sy m p Cente hony r! *Prices include facility fees but do not include sales tax. QUESTIONS? Our first-rate staff is happy to help. Pre-purchase your $30 parking six-pack when you renew your subscription. That’s a savings of up to 80%! Renew by May13 and enjoy these great perks! $5 PARKING! Pops subscribers get the best deal on parking! Pre-purchase your $30 parking six-pack when you renew your subscription. Thatâ&#x20AC;&#x2122;s a savings of up to 80%! PRIORITY SEATING as we move into the new Symphony Center! Our subscribers and donors get priority as we move into the new Symphony Center with further priority placed on length of tenure, frequency of attendance, and overall level of investment in your MSO. 20% SAVINGS and advance notice on any additional MSO concerts Subscribers move to the head of the line and save 20% off special performances and additional tickets. No hassle exchanges and lost ticket replacements Life can be hectic. Let us help! You can exchange tickets up to 24 hours before a performance by calling our ticket office or logging into your account at mso.org. 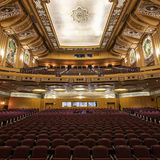 Exclusive benefits and discounts with our VIP Patron card VIPs get access to free streaming, additional savings on select concerts, and special offers from our partners around town.